Corporate sponsors and event donors help make vital programs at Orchard Place possible. By making a gift to one of our events, you help to ensure the continued success of our services and programs. We work hard to keep event expenses low so that the majority of the money raised goes to helping kids. It's a great way to support our work. Plus, if you haven't noticed, our events are a lot of fun! Our annual night time bike ride through the streets of downtown Des Moines and nearby trails attracts hundreds of cyclists each year. Next year's ride will be on Saturday, July 14, 2018. Riders cruise the streets of Des Moines in the moonlight while helping to raise money in support of Orchard Place children. The route features popular Des Moines attractions, including the State Capitol, East Village, Pappajohn Sculpture Park, Water Work Park and Gray's Lake. Prizes are awarded for Best Bike Lights, Best Helmet Lights, Best Costume and Best Team Bus. The largest registered team wins our Moonlight Cup, a traveling trophy, and a group prize. This year's ride will begin and end at The Iowa Taproom that features Iowa brews. Donations to this event will help us reach our goal of raising $120,000 in support of important programs and services for Orchard Place children. Corporate sponsorship opportunities are available. For more information, contact Brandie Broadhead, Director of Volunteers and Special Events at: 515-287-9621 or bbroadhead@orchardplace.org. Our annual School Supply Drive helps to ensure Orchard Place kids can start the school year off right! Kids who go to school unprepared may feel guilt or shame for not having the required school supplies. It may hold them back from learning. Your gift to our School Supply Drive will help to provide the necessary items - backpacks, pen, pencils, paper, etc. - to children in need at all four Orchard Place divisions. Join the Orchard Place Birthday Club and create special memories for a child who's hurting. What do most kids' birthdays have in common? Glowing candles, giggling kids, yummy cake, and special birthday memories. But sadly, not all kids' birthdays are this festive. Last year, more than 200 kids spent their birthdays at Orchard Place. Here to deal with painful emotional challenges, the milestones of life go on.kids start school, move on to the next grade, become teenagers, and observe holidays. It's hard to be away from friends and family on these special days, especially birthdays. You or your group can become a Birthday Club member by sponsoring a child's birthday party.cake, ice cream, balloons, a small gift and the trimmings for as little as $35. No one should go without these basics on their birthday, and with your gift, they won't! Donate now and type in "Birthday Club" in the Gift Designation box.and feel good in knowing you've brought birthday smiles to a child who's hurting. Questions? Contact Andrea Wright at aswright@orchardplace.org or 515-287-9605. "Adopt" a child and purchase gifts from their holiday wish list. Shopping and wrapping gifts is a great activity for families! Sponsor a holiday party for kids at our residential campus - provide pizza, pop and fulfill their Wish Lists. This is great for community groups and businesses! Donate gift cards or money that can be used to purchase holiday gifts for the children. Donate a group outing: purchase tickets to the Des Moines Playhouse, passes to Blank Park Zoo, or admission to the Science Center. This is a gift our kids can enjoy during the holiday season and throughout the year. 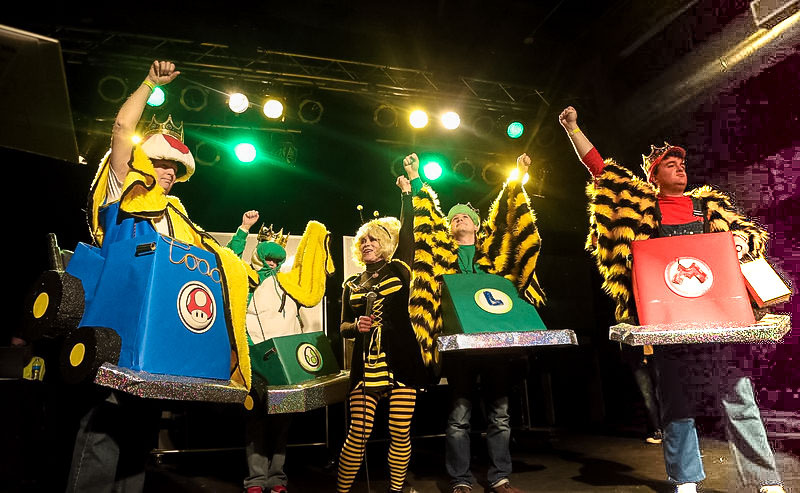 This zany adult spoof of a spelling bee was held on Thursday, March 1, 2018 Decades Event Center in West Des Moines and raised over $68,000 for Orchard Place! Want to join in the fun for our 2018 event? Check out the information below for the Spelling Bee basics! Two teams (three spellers from each) compete together on stage. They are given 30 seconds to spell the word on a dry erase board. Both teams can advance by spelling the word correctly. Bribe funds can be used to advance if teams fail in spelling the word correctly. Teams also complete in several contests, including Best Spellers, Best Team Name, Best Cheering Section, Best Costumes and Most Bribe Money raised. Words become more difficult with each round. Judges also up the bribery pay-off required to compete in each succeeding round of competition. The Grand Championship (Best Spellers of the event) can be secured through spelling or continued use of bribery funds. The money raised will provide much-needed support for Orchard Place children. You can help by making a donation to the event. Corporate sponsorship opportunities are available. For more information, contact Brandie Broadhead, Director of Volunteers and Special Events at: 515-287-9621 or bbroadhead@orchardplace.org. Your gift to the Rise & Shine Toiletry Drive helps to offset the costs required to meet the basic needs of the kids we serve. Orchard Place spends about $50,000 annually on products for the children in our care at our residential campus. Items needed include toothpaste, deodorant, soap, shampoo, hair products and general bathroom supplies. Product donations can be dropped off at any Orchard Place location or you can make a monetary donation.